Natural feminine care: made with natural Ingredients, summer's eve douche will leave you feeling clean and fresh. The mild, yet effective, ph-balanced formula has been gynecologist tested for gentleness to make sure you're getting the proper attention you so rightly deserve without irritation. Plus the one-piece unit is super easy to use. Simply remove the bottle from the safety sealed wrapper, pull the nozzle until it clicks in place and voila, it's ready for use. And rest assured the comfortip nozzle and easy-angle flexible neck make it easy and comfortable to use each time you douche. 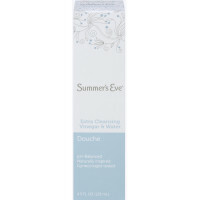 Freshness has never been simpler with summer's eve douche. Summer's Eve Fresh Scent Douche. 4.5 fl oz (133 ml). Natural feminine care: Made with natural ingredients, summer's eve douche will leave you feeling clean and fresh. The mild, yet effective, pH-balanced formula has been gynecologist tested for gentleness to make sure you're getting the proper attention you so rightly deserve without irritation. Plus the one-piece unit is super easy to use.